The youth hostel resides outside the Old Town. You get there after a 20-25min walk from the Main Bus station and it takes you 10min to get to the Old Town via Branitelja Dubrovnika street, as well. Once you get there you will find quaint marble streets and splendid buildings in the old town, swimming in the cool, quiet Adriatic, sleepy nights at the open air cinema, salty sea food all amounting to conclusion made by G.B.Shaw. You have to go there to know what is it all about. Hostel has 82 beds, be sure to book in advance. We have dorms with 4 or 6 beds (bunk beds). Showers and toilets are shared in the corridor. 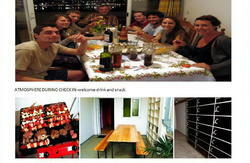 Hostel has a self-catering kitchenette where guests can prepare own meals, TV and dining room, terrace, coffee machine. Bed linen is provided (included in the price). Please note that our hostel is Hostelling International youth hostel, so your HI membership card will be required at reception upon arrival. Non-members have to buy Welcome stamps at arrival (extra 10,00 kuna per day). Please note that tourist tax (7,00 kuna per person/per day) will be added to your balance upon arrival. Upon arrival you will be asked to pay the full amount for the whole duration of your stay. Take a bus #1, 1a, 1b or 7, get off the bus at Boninovo traffic lights (Dom zdravlja), look for Bana Jelacica street. Go down the street, near the caffe bar Ferrari there are steps (Vinka Sagrestana street) that will take you to the hostel. Bus ticket costs 12 kuna if you buy it at the kiosk or 15 kuna if you buy it in the bus. There is no regular bus service to/from Airport. There is a shuttle bus of Atlas travel agency upon arrival of every regular flight (not provided for charters) -price 35 kuna. city) and then it stops at Main bus station that is actually the last stop. You can also ask the driver to stop at Boninovo traffic lights, that is only 3-4 minutes of walk from the hostel, but he is not obliged to stop there. We recommend to get off the bus at Pile gate, rather than on the Main Bus station, because it is closer to hostel (10-15 minutes of walk). You can also catch one of the local buses from Pile (any bus number) and get off the bus at the 1st stop after the first traffic lights -crossroads (it should be 3rd stop from Pile gate). Then look for Bana Jelacica street (close to the traffic lights), go down the street and, you will see caffe bar Ferrari. 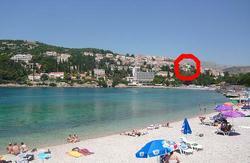 There are steps near the caffe (Vinka Sagrestana street) and we are there at the end of the stairs. Taxi service from/to Airport costs 250 kn or 35 EUR.